San Jose State University and University of Idaho (c/o NASA Ames Research Center). The TechEdSAT-3p will be the first flight test of an Exo-Brake passive de-orbit system. TechEdSAT-3p is a triple cubesat (3U) with a set of dual advanced avionics systems powered by the previous core system. In 2U of the packaging (roughly 2/3 of the volume), there is stowed an erectable deployment system that would place the Exo-Brake in the desired orientation. Scaled as a 10 day experiment, the deployed system has the ballistic coefficient of 5 kg/m2 – and is constructed as a tension-based structure that would not entangle itself. 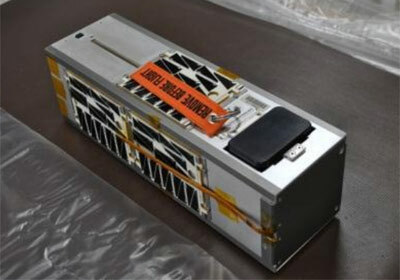 During the de-orbit process, GPS data from the dual avionics as well as collected TLE (Two Line Elements) provided by the USSTRATCOM will be used to analyze the flight dynamics and compared to computational models. This experiment will be the antecedent of related experiments at larger scale (e.g., for a 1.5 day de-orbit) and controllability. The 3U cubesat was deployed from the ISS on the 20 November 2013 at 07:58 UTC but never heard.